This entry in Kelly’s diary gives an excellent illustration of what was close to his heart: music and rowing. Frederick Septimus Kelly was born on 29 May 1881 in Sydney. Frederick was the seventh child of Thomas Hussey Kelly, a wealthy Irish businessman, and his wife, Mary Anne, born in Australia. Like his brothers, ‘Sep’, as he was called by the family, was sent to Eton, where he began to row in 1897 - stroking the eight to victory in the Ladies’ Plate at the Henley Royal Regatta in 1899. As a Lewis Nettleship musical scholar, he went up to Balliol College at Oxford. 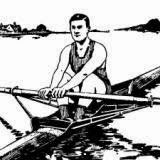 In Oxford, Kelly – or ‘Cleg’ as he was known there - also took up sculling, winning the Diamond Challenge Sculls at Henley for his college in 1902. On his way to his first Diamond victory, he beat prominent scullers as A. H. Cloutte (London RC), C. S. Titus (Union BC, New York), and R. B. Etherington-Smith (Leander Club). One reason for the loss, T. A. Cook wrote, was that Kelly had only trained in his boat for three weeks before his first race in the Diamonds that year. 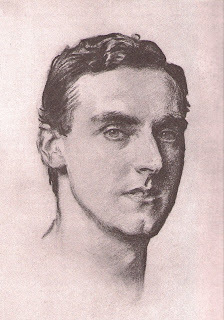 Kelly’s unwillingness to train, made Vivian Nickalls write in his Oars, Wars, and Horses (1932) that Kelly ‘hated training and spent his whole time playing the violin.’ Vivian’s brother, Guy, agreed and wrote in his posthumous published memoirs, Life’s a Pudding (1939), that Kelly ‘was most likely the fastest sculler of all time – quick, neat and polished’ but added solemnly ‘a difficult man to train.’ Unfortunately, Vivian Nickalls’s comment about which instrument Kelly played would later make rowing historians joke and incorrectly remark that Kelly was a sculling ‘fiddler’. Revengeful at the 1905 Henley Royal Regatta, Kelly easily outclassed all his opponents in the Diamonds (Scholes was not competing), trashing poor Blackstaffe in the final with 15 seconds, winning in the new record time, 8 minutes, 10 seconds, beating the Canadian’s record time from the previous year by 13 seconds. Kelly’s record would last until 1938, when the American Joe Burk knocked 8 seconds off Kelly’s time. In 1905, Kelly would also win the Grand (as he had done in 1904), and adding another triumph in 1906 in the Stewards’ Cup. In Kelly’s personal life, his father’s death in 1901, and his mother’s death the following year, was a hard blow for Kelly, whose academic studies suffered, and he graduated with fourth-class honours in history. However, his father’s passing left Kelly economically independent, which allowed him to set up a comfortable life with his sister Mary, ‘Maisie’, at Bisham Grange, a house close to Marlow. There they lived a high-society life with trips to London and abroad. Kelly, with his good-looks, was also invited by aristocratic friends to give piano concerts in their country houses.